And only fair when we fondly gaze. Till breathed with joy as they wander by. Their dower of beauty from thy glad looks. For Bryant, the sweetness of nature appears only when we “fondly listen” and its beauty only when we “fondly gaze.” At first glance, he contradicts Keats, who had told us that unheard melodies are sweeter. But actually not, since both call for our loving eye to be part of the beauty we see. Both poets conveniently conclude that it’s the poetic imagination that imparts real meaning to what we see or hear. 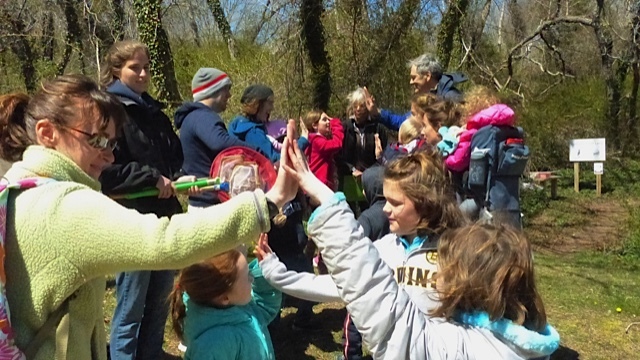 In any case, the idea of bringing our gaze to nature is central to the Tales & Trails: Nature Walks for Young Explorers program, sponsored by the Wellfleet Conservation Trust (WCT). I was lucky enough to go along on the latest walk last Wednesday along an ephemeral pond beside the Walker Trail. It was a beautiful April day with clear skies and fresh breezes. There were no fragrances other than fresh clean air. 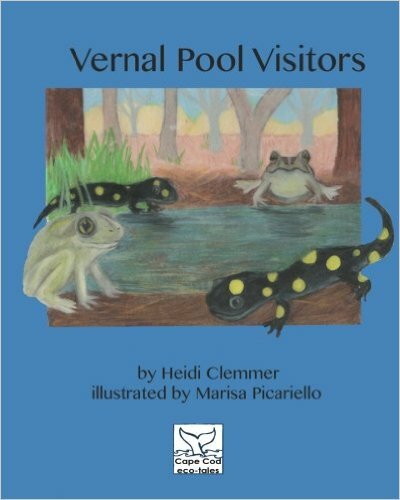 We heard, or rather interacted with, Vernal Pool Visitors, and compared it to what we observed. Walks through some of Wellfleet’s conservation areas are led by Heidi Clemmer, author of a new series of nature books for children called Cape Cod Eco-Tales. 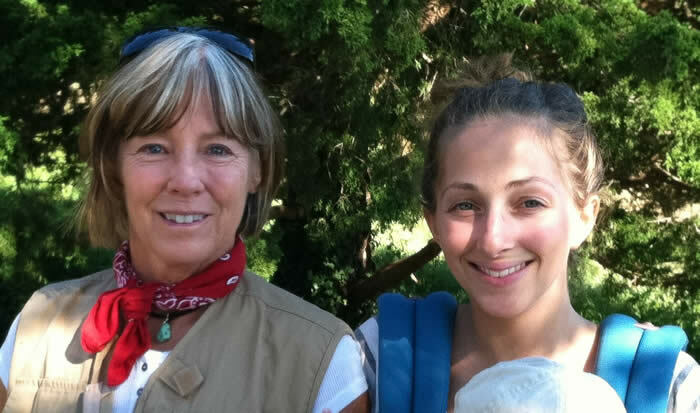 After 21 years as an elementary school teacher, Heidi retired and began to focus on teaching children about nature in informal, specifically, natural settings. She launched Eco-Tales with illustrator and collaborator Marisa Picariello. The target audience is children aged 6-9 and their families, but everyone from infants to those well into the their quatrième âge enjoy it. 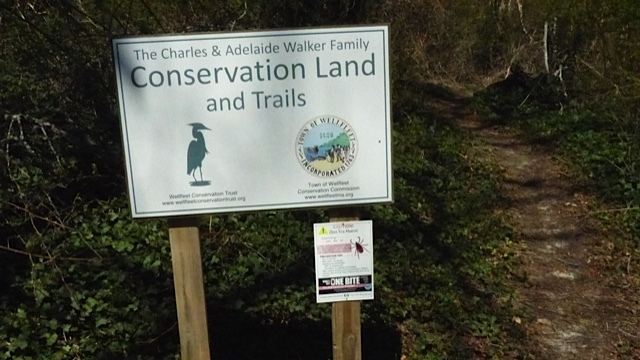 Each walk focuses on a different ecosystem and is paired with one of the books in the series. Children explore the ecosystem, hear a corresponding nature story read by the author and illustrator, and then create their own souvenir of the experience in art, writing, or photography. The event combines fellowship, keen observation, story-telling, art, experiencing the beauty of Wellfleet’s conservation lands, speculation about science, and learning. 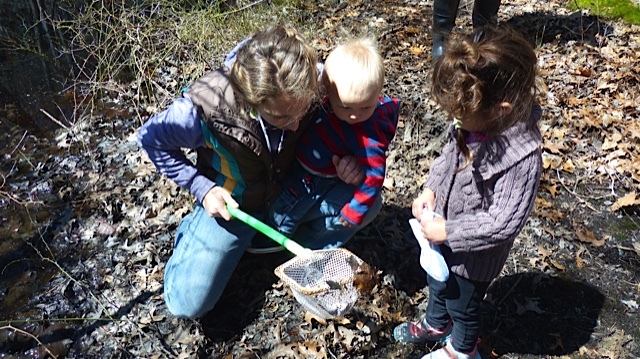 Last fall, Heidi led a trip to Hamblen Park, where she read from her book Salt Marsh Secrets. There will be five more walks this year. Next up is “Heathland Habitat” in May, followed by“Barrier Beach Bums” in June, “White Cedar Swamp Gang” in September, “Tidal Flat Friends” in October, and “Dune Dwellers” in November (more information). Tales & Trails is funded by WCT and supported in part by a grant from the Wellfleet Cultural Council. Wellfleet Conservation Trust is a non-profit organization established in 1984 to assist and promote the preservation of natural resources and rural character of the town of Wellfleet. There is no cost to participate in Tales & Trails, but advance registration is required. To inquire about the walks, email Heidi Clemmer.